In theory, vintage shopping is great -- you get to shop through plenty of pretty things from decades past and you're pretty much guaranteed to end up with a one-of-a-kind look. But in reality, shopping at second hand boutiques and shops isn't all it's cracked up to be. You've got to deal with weird sizing, overwhelming racks, and of course, that horrible, horrible smell. But for some reason, you do it anyways. For you, we sympathize. But we also totally get it, because as fashionistas, we've been there, done that. 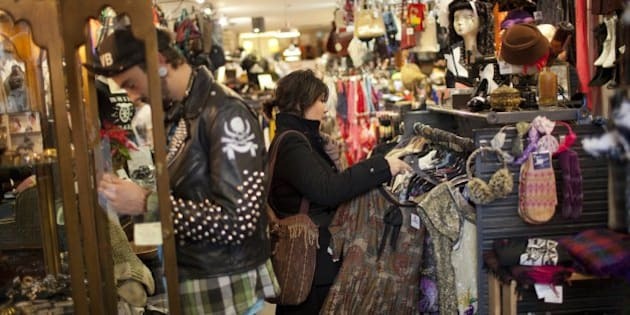 And even though we like to think we've mastered the art of vintage shopping, we still haven't. For a little glimpse into the lives of vintage lovers, just check out the 15 struggles we all deal with below. Get out before it's too late! Bring on the vintage shapewear to match! How did you not see them before? The not-so-perfect mix of dust and moth balls (that never fully goes away). All you can do is pray this doesn't happen to you. Turns out that grey sweater you bought was actually a nice shade of puke green. Nope, that Northern Getaway Spice Mice sweatshirt doesn't count! You can always wear it in the house while vacuuming! Why you bought that dress in the first place, you have no idea. Silly you! Thinking you were actually saving money. And when it does happen, you're devastated. And realize it was totally worth it.